Easy Beans recipe by Jannu at DesiRecipes.com. 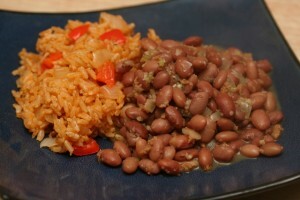 A delicious taste of homemade beans which can be served as a meal or as a side dish with your choice of rice. Add onion , tomatoes ad garlic in a medium sized sauce pan. Fry until everything starts to cook down. Next add the variety of beans and put some garlic power and cook until beans are soft but thick (less liquid in pot) then and the milk. Stir and serve hot over rice.